A lovely, upgraded & well maintained two bedroom, two full bathroom, 1,740 square feet (est.) 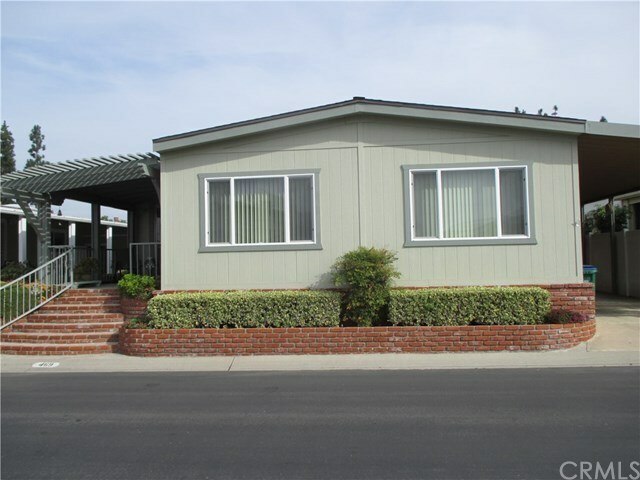 home located in a beautiful Senior Resident Owned Mobile Home Park in Irvine, California - THE GROVES. The price includes the home & a share of the corporation that owns the land, so NO SPACE RENT! Wonderful curb appeal with custom brick features. A nice roomy front porch patio & a private patio off the Master Bedroom. Enter to find this home flooded in natural light . Included is a Living Room, Dining Room with high ceilings, a large Kitchen with granite counters & back splash, upgraded appliances (gas stove and oven), upgraded cabinets, deep double sinks, and room to eat in this Kitchen, the Family Room offers plenty of room, your own inside Laundry Room with a whole wall of STORAGE cabinets & an office desk area, the upgraded hall/guest upgraded bathroom with tub & shower, the second bedroom (newly painted), the spacious Master Bedroom with a whole wall of closet PLUS a generous walk in closet too, off the bedroom is a back private patio, the Master Bathroom with tub & a stall shower, double sinks too. This lovely home is located a stroll away from our own Community Park, garden spots (grow your veggies), tennis court, Dog park, RV parking lot, plus so much more.... More to offer the active senior and amenities for those who desire a slower pace. Low Maintenance fee ($221/mo.) and financing is available. Inclusions: Washer, dryer, refrigerator. All the furniture is also included.